Hello there! Thanks for coming by for the Quilter's Gallery Giving Thanks Blog Hop. I am super excited to be participating in this blog hop and look forward to visiting some new sewing blogs and making some new quilter friends. In case you are new here, my name is Sara Birch. I am a late night quilter, DIY-er, and mother to four handsome little men. I started this blog a little over a year ago as a way for me share some of the projects I've been working on. You can read more about that, and me, in the About tab at the top of the page. And my Nova quilt (pattern coming soon). I am also thankful for my amazing little family. They mean the world to me. Today I am giving away some Moda pre-cuts. I love Moda and pre-cuts! Up for grabs is one charm pack of Freebird by MoMo and a mini charm of Marmalade by Bonnie and Camille. Leave me ONE comment on THIS POST for EACH additional entry. Oh, and when you comment please click on the "Notify Me" button. I will reply to the winning post and this will help me notify you as the the winner. The winner will also be announced on Facebook, so if you've liked The Aqua House you should be able to see if you've won. This giveaway is open until November 26th. I will notify the winner on November 27th. Winner will be chosen via random.org. 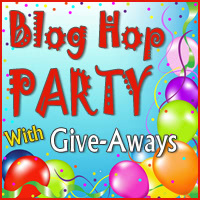 Thanks for stopping by and Happy Blog Hopping! I pinned your quilt scrap hot pads project to pinterest. I commented on your "How to Bind a Quilt" post. By the way...if you need help binding all those jean quilts, let me know. I'd be happy to help you out! Thankful for cute and great blogs like yours!!! Thanks for the effort and ideas you're putting into your little corner of the world! Commented on your fantastic jean quilt post!!! And of course, I forgot to "notify me" on the other comments. LOL! Thanks for chance to win. I liked you on facebook. WOW I love your Swoon. I must make one soon :) Great giveaway - I have liked you over on Facebook. I am thankful for my boys as well. Thanks for the giveaway! 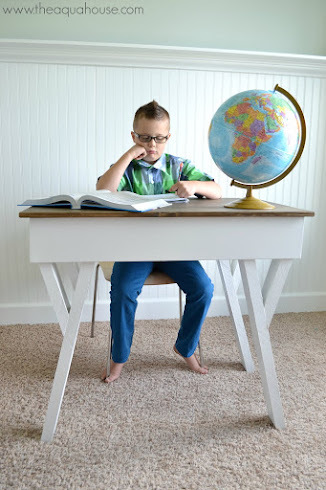 I think I've found a new blog for wonderful inspiration!!! i pinned your swoon pic to pinterest! i love that quilt!!! I liked your facebook page, thanks! I'm following you on IG, thanks! I commented on your stamped burlap banner post. Cute! Your blog looks like lots of fun! I'm thankful for many things, but definitely thankful for a separate room to create in! Liked you on FB. Thanks for the chance to win. I'm thankful I have so many wonderful friends and family in my life! I commented on you Baby Love baby quilt post. I like you on Facebook (Rhonda Gaines Desgranges). Thankful for my family & my health. I survived 2 strokes, and learned to write, quilt and walk again!! I follow you by e-mail. Thanks for the chance to win! I am thankful for the family I had....my husband died 10 yrs ago and our only child 4 yrs ago.... your family is gorgeous! Now following your Facebook page. I am thankful to now be cancer free and on the mend. I am also very thankful for my husband finding a new job. And I am always thankful for the family I am blessed with. I am now following your blog via Bloglovin and GFC. Thank you for the chance to enter your lovely giveaway. Following your blog with bloglovin. I am thankful for my health and to be living in a place I love. I liked you on FB. Thanks for the chance to win. I am thankful for children and grandchildren who love Jesus. I'm thankful for the love & support of my husband. He's never complained about my fabric stash. I'm a new follower with Bloglovin'. Thanks. I commented on your Baby Love post you did in August. Thanks again. I am thankful to be able to enjoy Thanksgiving this year with both of my grown children. I commented on The Upside to Economic Downtimes. I'm thankful for family. Really- as I get older and family decreases in size I'm really thankful for the time we have together. I liked you FB page. Thanks! I'm thankful to know there are other moms of small children who quilt late into the night. Thanks! I am thankful for the internet! I've liked you on FB. 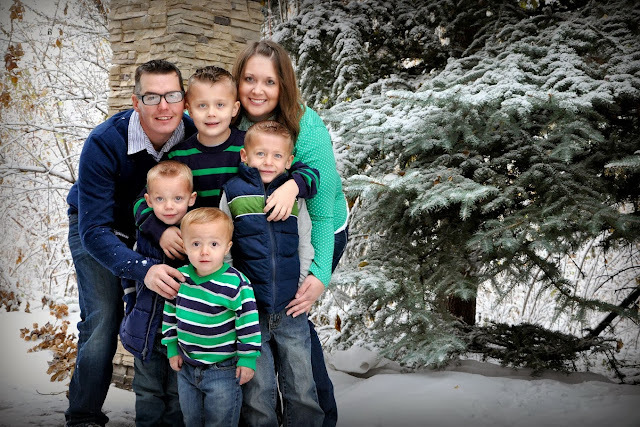 You have a gorgeous little family. Bless them all. I am thankful for the ability to enjoy all that I see around me and to take time for blogging. I liked you on FB. I also enjoyed reading several of your FB posts. Enjoyed the one about the Economy, and how you began your married life with all new things, but. Now you're re-evaluating older items to see what can still be useful, or sold to make room for other things. I like the idea of selling and using the money to purchase fabric. I know I have way too many "things", especially crafting supplies, tools etc. I have a ton of scrap booking tools supplies that I no longer want, or use. Thanks for the opportunity to win the pre-cuts. It is a great prize. I like you on FB. Btw, I love the picture of your boys. Wow, how you do four boys is beyond me. I have 2 year old boy/girl twins. They are plenty enough for me to handle. I hope you have a happy Thanksgiving. I am thankful for my husband and two children. They are my world. I don't know what I did before I had them in my life. It sounds like it would be very boring to me now. I shared this post via FB. I started following you via Instagram. You have some very beautiful quilting pictures on there. It made me a little jealous. I wish I had your skill. I'm a newbie and don't really have much skill yet. 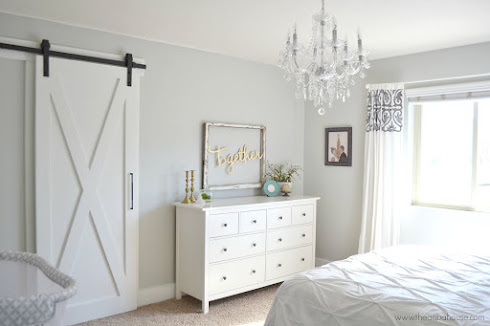 Pinned a grey and white quilt from one of your boards. It is such a fun board that I started following. I commented on the "Mini Raincheck" post. That quilt is so cute. I pinned the binding tutorial. Great one! I follow with Bloglovin too. I am thankful for my husband who never complains when I buy fabric. Hello - I'm thankful for my family, my friends, my community, my church and my faith. Thanks for letting us stop by. Please visit us at Prairie Cottage Corner. We'll have a warm cup of cocoa and talk about our blessings, eh? See you. Hello - I liked you on Facebook. Hi - I'm following you on Bloglovin. I pinned your binding tutorial on my Pinterest page under Prairie Cottage Handwork. Hi - When I first joined a blog hop party, one of my followers suggested I remove the captcha (?) puzzles that appear before posts can be visible. They are rather difficult to negotiate. That was a while ago and I have not regretted it. You might try it too, especially with so many posts to make here for your give-away. Thanks for letting us visit. Do stop by and visit me, as well. I liked you on FB. We had four sons too.....and 7 years later we had a daughter!!! SHARED LA LOVE PILLOWS ON PINTEREST! HELLO, SO THANKFUL FOR LOVED ONES GOOD HEALTH+HAPPINESS! I liked you on FB...lovely family. I have 3 grown sons and now 4 grandsons....love it!!!! I clicked on the Like button on your FB page, but the number didn't change. I tried it twice. I really like your Swoon quilt. I am thankful for family, friends and good health. I am a new follower with GFC. Thanks for the giveaway. I am thankful for my family. I love your swoon quilt, just started mine today. I am thankful that my dad made it through his surgeries this year. I just liked your Facebook page. Thanks for the chance to win! 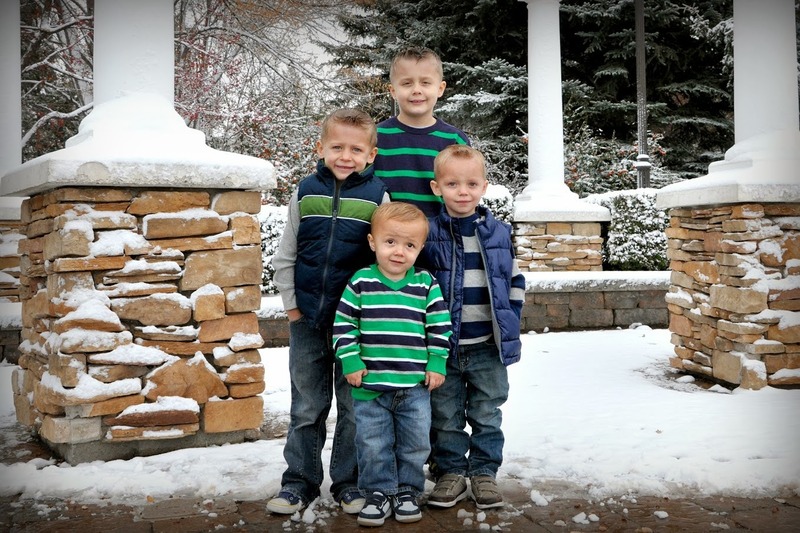 Loved the photo of your 4 boys. How do you ever find time to quilt???? I commented on your DIY Framed Mirror. I love your idea. Thatnks for a cheerful giveaway. I like you on Facebook. I 'liked' your Facebook page! I am thankful for those wonderful women who taught me to quilt, my mom, nanny and grammy.. they also taught me to share with others and today I do follow in their footsteps. I am thankful for agile fingers to sew with! I "like" you on Facebook! 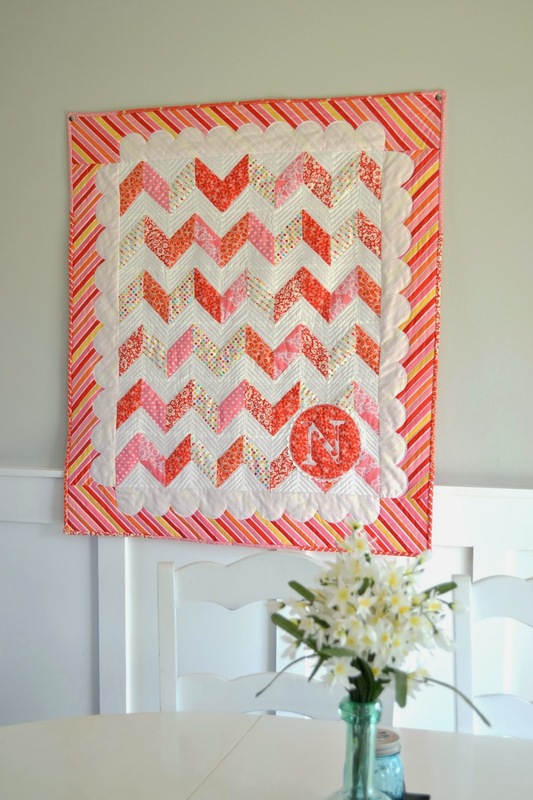 Always fun to find another quilt blog! I am thankful for my wonderful family! Thanks for the giveaway - and you have very cute sons! Hi - liked on FB- love the bloghop too - first time, very educational, love making the links to all. I liked your FB page (Piroska B). 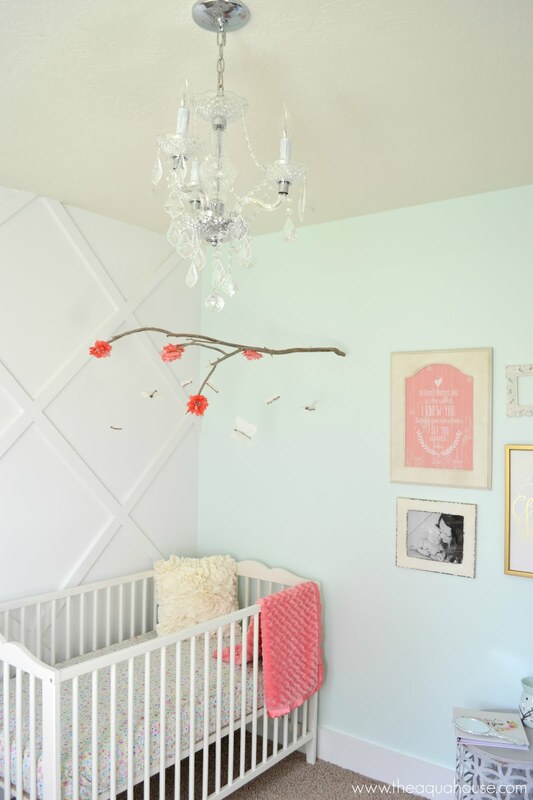 What beautiful family photos and a great giveaway!! I am thankful for my good health! I like your FB page too! I am thankful for my furnace these cold mornings. You've got a new IG friend too! I went to facebook and liked you. I like your decorating ideas and shopping at thrift shops. I'm thankful for my family - especially my husband! Thanks for the chance. I liked you on FB - thanks for a wonderful giveaway! I'm thankful for my son's health. He's had developmental challenges since birth and we're finally figuring out what the issues are. It's nothing life-threatening and something we can learn to overcome. So thankful for that! I've started following you on bloglovin. I liked your FB page and thank you for the giveaway. I am thankful that my parents health is still well. I liked your FB page and I am thankful for my family. I commented on your denim quilts post. I pinned your binding tutorial on pinterest, thanks for the chance. I'm thankful for a caring and loving husband. I liked you on FB. Thanks for a chance to win. I'm following through Bloglovin. I'm thankful for my family, friends and good health. I just commented on Robots. 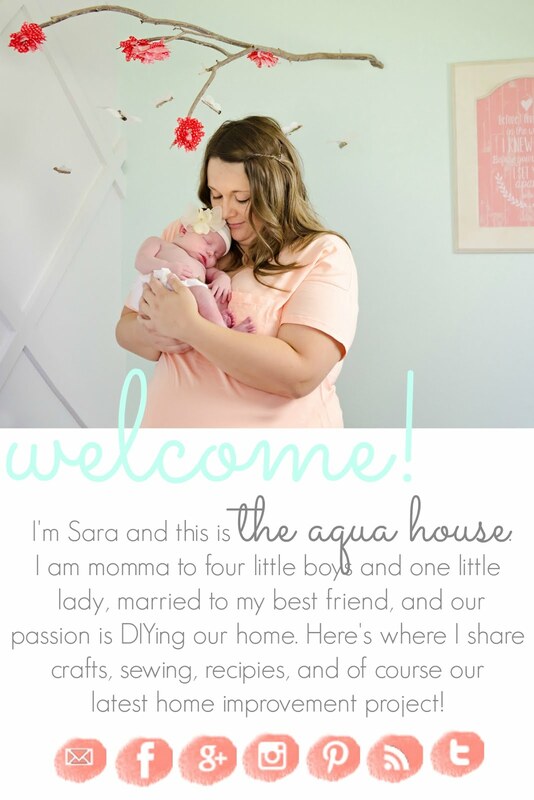 I liked the Aqua House on Facebook! I just pinned the scrappy pot holders. It looks like it would be a quick and easy gift idea. I am thankful for so many opportunities to win these lovely fabrics and for family and friends!! Awesome giveaway! New follower on FB. I'm so thankful that my son returned safely from his deployment in Afghanistan with the USMC and will be having Thanksgiving with us. Your quilts are beautiful! 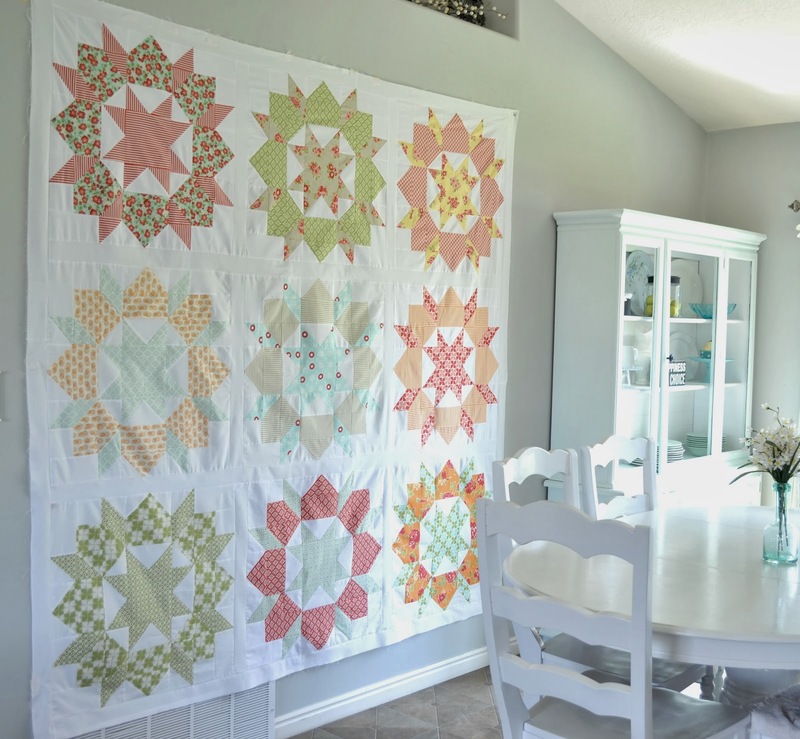 The Swoon quilt is on my to-do list, hehe. Shared your giveaway on FB using button at end of your post.